Help : I purchased proper media to upgrade SQL version, still setup thinks that its Evaluation. What’s wrong? Have you came across the scenario where you are performing a version upgrade of SQL Server as per supported path described here but still you are facing below error message during rules check? 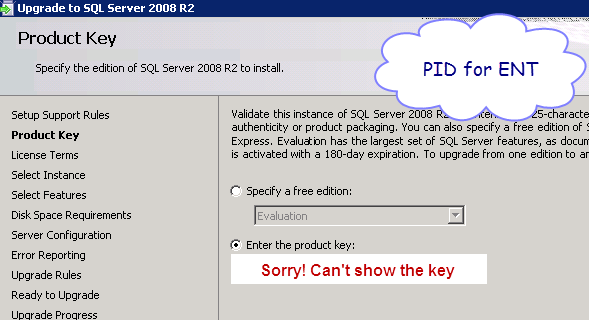 Rule "SQL Server 2008 R2 Feature" failed. The specified edition upgrade is not supported. For information about supported upgrade paths, see the SQL Server 2008 R2 version and edition upgrade matrix in books online. 2011-01-27 22:53:34 Slp: — SkuUpgradeRule : Rule ‘FeatureUpgradeMatrixCheck’ looking for previous version upgrade data for feature package ‘sql_as_Cpu32’. 2011-01-27 22:53:34 Slp: — SkuUpgradeRule : Rule ‘FeatureUpgradeMatrixCheck’ feature package ‘sql_as_Cpu32’ found no upgrade features. 2011-01-27 22:53:34 Slp: — SkuUpgradeRule : Rule ‘FeatureUpgradeMatrixCheck’ looking for previous version upgrade data for feature package ‘sql_engine_core_inst_Cpu32’. 2011-01-27 22:53:34 Slp: — SkuUpgradeRule : Rule ‘FeatureUpgradeMatrixCheck’ found sourceVersion 8.0 and edition STANDARD for feature package ‘sql_engine_core_inst_Cpu32’. 2011-01-27 22:53:34 Slp: — SkuPublicConfigObject : ValidateSkuMatrix source and target architecture match. 2011-01-27 22:53:34 Slp: — SkuPublicConfigObject : ValidateSkuMatrix did not find a match in sku matrix . 2011-01-27 22:53:34 Slp: — SkuUpgradeRule : Rule ‘FeatureUpgradeMatrixCheck’ feature package ‘sql_engine_core_inst_Cpu32’ is blocking upgrade. 2011-01-27 22:53:34 Slp: Rule evaluation message: The specified edition upgrade is not supported. 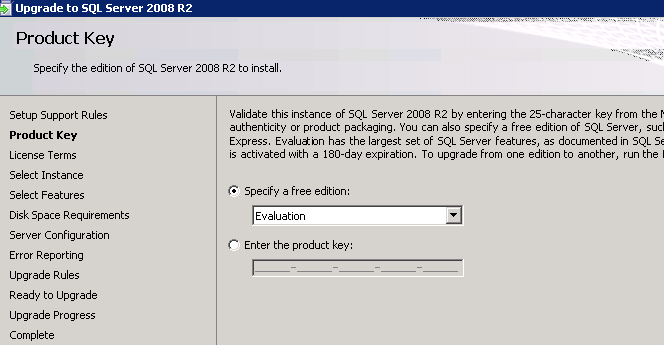 For information about supported upgrade paths, see the SQL Server 2008 R2 version and edition upgrade matrix in Books Online. On a side note, Do you know the media difference for Standard and Evaluation edition? Well, there is no difference! 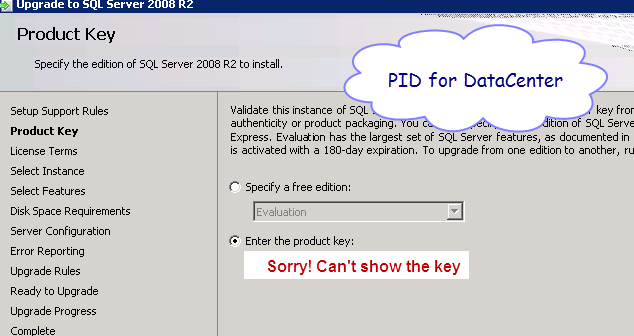 Its the PID (Product ID) in below screen which decides the edition to be installed. The value of PID is picked from DefaultSetup.Ini file located on media. If there is no such file on Media then it would be enterprise evaluation edition of SQL Server. Here is the little test which would prove the theory. I swear to god that I have not hit cancel while doing the test. Its the same media used for all the screen (Evaluation Media) All I did was change value in Enter the Product Key and hit next> or previous<. Since I had media for various editions (How? Did I tell you that I work with Microsoft SQL Support team.. lol! ), I copied/pasted the PID from DefaultSetup.ini file and rest can be seen above. You might say, Nice to know what’s happening behind the scene but what you need to do if you run into such situation. In my scenario customer informed that they purchased Standard edition of SQL Server 2008 R2 still its taking EVAL in targetEdition and there has to be flaw somewhere. Later we found that screen was selecting Enterprise Evaluation by default (not sure why) So once he entered the Product Key, it worked like a charm! Now, go ahead with the setup and post a comment here if this helped. Help : I lost sa password and no one has System Administrator (SysAdmin) permission. What should I do? If you are thinking that I am going to show you black magic to recover sa password or other login’s password then you have hit the wrong blog post. go back to search engine and search for better tool/utility. Only sysadmin user is SA and I Lost SA password. I am windows admin. How can I get sys admin privileges on SQL server express as I removed all sysadmin accounts from SQL. Unable to create new database. This is generic error which means that you are not having permission. When you attempt to change password of ‘sa’ you might see below error. All error messages appear because your account is not a System Administrator of SQL Server Instance. 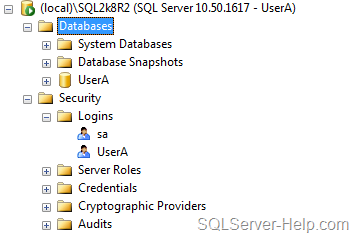 Stop the SQL Server Service using ANY of below command. Use Services console [ Start > Run > Services.msc] and locate the SQL instance you want to stop. Start SQL Server in Single User mode. 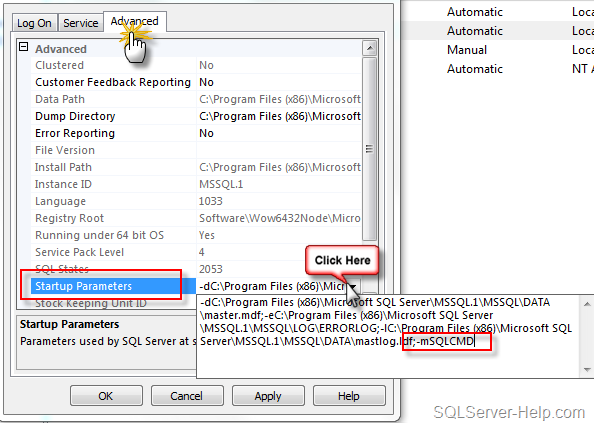 You need to use start-up parameter m to start SQL Service in single user mode. I prefer command line but its your choice. Connect to SQL Server and add desired account in SysAdmin role. You are connected as System Administrator, because you are part of local administrator group in windows. At this point you can add any account to sysadmin because you are connect as sysadmin. Here is the script I normally use to add local administrator group as a part of SysAdmin group in SQL Server Instance. You may want to tweak this as per your needs because I am adding all local admin as sysadmin which is not a good practise. Here is the MSDN reference for above, just to show that its documented. So, to conclude, I have not shown any trick to recover any password. Just showed you detailed steps to gain sysadmin access provided you have windows admin rights.